Callahan Banks returns to her beloved Timicau Island near Charleston, South Carolina, to settle her mother's estate. Her grief is compounded by Pepper Dade's plans to develop the island and destroy the only home she's ever known. When the body of a bikini-clad blonde washes up on the beach, Callahan is pulled into a web of intrigue that has her questioning all she thought she knew about her own life. Struggling to resist her attraction to Pepper, Callahan suspects he may be involved in the death of the blonde. She ignores her misgivings until nine-year old freckle-faced Harry Applegate, her sidekick, disappears. Now Callahan must muster all her skills as a naturalist and tracker to find the little boy before it's too late. Dershie McDevitt lives outside of Asheville, North Carolina with two Wheaten Terriers and her first and second husbands. This works well because she's had the good fortune (he says) to marry the same man twice. Her whimsical house, located in a mountain valley teeming with wild creatures, is a perfect habitat for a girl raised in northern Wyoming. The McDevitts' vacation home on Dewees Island, off the coast of Charleston, South Carolina, is another wild and natural place. Their home on stilts overlooks a swamp pond with a fourteen-foot alligator and a myriad of flying, roosting, nesting, fishing, squawking birds (well over 200 species now). 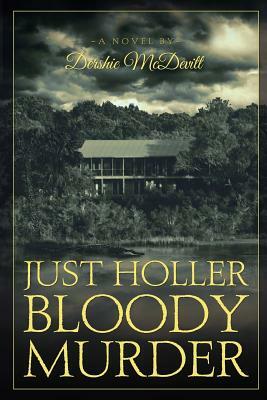 Dershie's first novel, "Just Holler Bloody Murder," draws on her love of nature and adventure. In a setting very much like her Dewees Island retreat, the author creates a world where murder and mystery mix together with romance to create a wonderful and slightly quirky read.